Avira Phantom, the antivirus company from Germany, offers a VPN client to download. It allows users to move invisibly and anonymously within a network, to hid their IP address, and to protect themselves against malware or hacks. This is especially important when surfing on a device using open networks, such as in hotels, coffee shops, or other free Wi-Fi hotspots that are generally not properly protected. 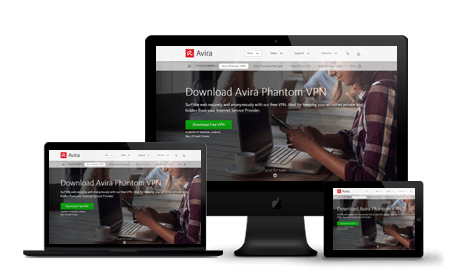 Avira’s Phantom VPN is downloadable for mobile devices as well as for use on PCs and Macs, and it offers non-registered users 500 MB a month of free traffic. If you register free of charge on the Avira site, you will receive an additional 500 MB per month. This VPN client is mainly aimed at individual users and their personal devices and can securely connect in 20 different countries. Up to 1 GB is available free of charge. If you require more, a premium membership is available with unlimited bandwidth. The Avira Phantom VPN PRO offers two price options. Customers can get a monthly subscription for $7.99 and can be terminated at any time. Alternatively, an annual subscription is available which costs $5.17 per month or a $ 61.99 a year. Avira’s Phantom VPN Client can be downloaded from Avira’s website without registration. The VPN client is available for Windows, Android, Mac and iOS. Once the client is installed, it is very easy to use. Simply click on “Save my connection”, and Avira will set up the connection automatically. Highly optimized servers promise unthrottled speeds, which means there should be no problems streaming HD video and music from services like ESPN, HBO Go, and Spotify. The Settings feature allows you to specify the location of the server you want to connect to. This allows users to gain access to content that is blocked in, for example, Germany by bypassing general geo-blocking. There are over 30 server locations available including Germany, Austria, France, Sweden, UK, USA and more. The Phantom VPN Client supports Windows, Android, Mac, and iOS without any problems. The VPN client uses an OpenVPN protocol to ensure the protection and privacy of users, which in contrast to PPTP is impossible to breach. However, the company stores both the IP address and the traffic of their users on a server, which could be a problem for some users. Although the VPN client can theoretically be used without registering, Avira will still have access to user devices and data. Sending of diagnostic data can be deactivated in the VPN client under “Settings.” From a privacy protection standpoint, this is advisable. Avira’s customer service is really friendly and caring. Although we had problems initially with the connection (it was not Avira’s fault but was related to the specific laptop that was used), the customer service representative took care of us immediately and worked hard to solve the tricky problem. Customer service is available via email, phone, and Twitter. While personal Avira customer service is only available for premium members, the Avira website has a blog, community posts, and an IT lexicon which addresses many technical questions and offers advice. The VPN client connects to the selected server within three seconds, which is pretty fast. When it comes to larger data volumes, the connection sometimes gets a bit slower. However, the connection remains quick and easy, which makes streaming high quality movies, videos and video games easy . Avira’s Phantom VPN Client is very easy to use. Mac users need to note that the VPN client is at the top of the task list and cannot be moved. To close the VPN client, click on the icon on the top, as the window cannot be moved. Downloading is done directly from Avira’s website. The interface of the VPN client is self-explanatory, and connecting is very easy, taking just one click. Just make sure that the VPN client is activated. If you only use the free version that offers 500 MB, try to avoid actions other than streaming a movie or downloading an app. Otherwise, the 500 MB will very quickly be consumed. The Avira Phantom VPN Client is especially recommended for private users. It’s easy to use and offers free traffic of up to 1 GB as nice benefits. We think that the $ 8 per month subscription is a bit expensive and might not be necessary, especially since it is a bit unclear to what extent a user’s privacy is protected from Avira itself. But overall, it’s worth it to use this VPN client when on the road, on trips, and when using open networks in order to protect one’s data from external attacks.